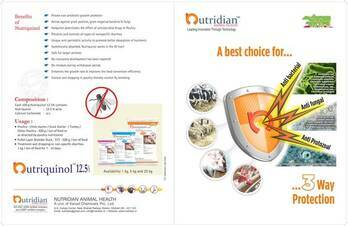 See more in "Consultancy - Advising"
Nutriquinol 60% - The Most potent solution for enteritis & diarrhoea, this rainy season from Nutridian Animal Health. Every year Rain brings - enteritis, diarrhoea & coccidiosis common problems to poultry. This year for the prevention & treatment of these common problems Nutridian AH presenting - Nutriquinol 60%, a most potent, effective, proven & economical solution. The Nutriquinol is - intestinal peristaltic motility regulator, antibacterial, antiprotozoal & antifungal in nature. So, prevent enteritis, dirrhoea & support coccidiosis treatment this rainy season with Nutriquinol 60%.